Nina G. Nahkala’s artistic vision is an amalgamation of the influences of her multi-cultural upbringing; she visually devoured her surroundings and assimilated them into her own unique way of portraying life and the mysterious magic of eternal beauty. Nina G. Nahkala paints the inevitable transformation of all matter into the abstract, through the use of figurative subject matter. Each of her oils is a painted dream composed of light, colors and emotions. Nahkala uses symbolism to unlock our imagination: the metaphor of the figure of Woman as the keeper of the secret inner garden in all of us is a recurring theme. These serene works possess a timeless quality that takes the viewer on an inward journey into the depths of the imagination. Her use of color evokes harmony and innocence; the soft, suggestive color groupings of misty blue-grays or warm umbers recall mythical goddesses of ancient frescoes. Her tranquil tones and subtle use of line are always evolving, revealing the inner layers under the surface of perceived reality, tempting and drawing us into the unknown. 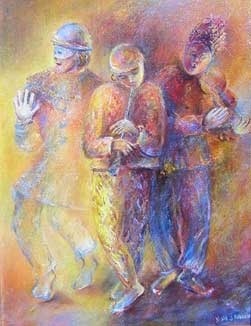 The artist was born in the Republic of Georgia and grew up in five countries of the former Soviet Union. She lives and works in Finland, where she exhibits regularly. Gallery Location: Agora Gallery, 530 West 25th Street, Chelsea, New York. Gallery hours: Tues-Sat 11- 6. Please visit Agora-gallery.com for more information. If anybody living in New York wishes to attend the opening reception, please contact me at asa@ovimagazine.com and I'll see if you can go as a representative of Ovi. Perhaps you could wrote a revoew for us. From its description, this is surely an artist worth knowing. I will point this out with a link via e-mail to my Humanities' students at Barry University (Miami), should any of them be in New York at the indicated time.